When Walter Haskell Hinton sold images to big picture printers and publishers such as Brown & Bigelow, he did not always know where they would end up. 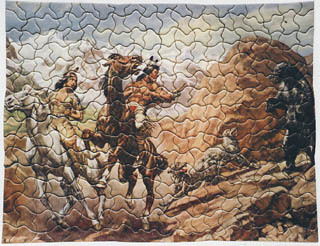 As it happens, Hinton was good at making Western and wildlife images that appealed to many people, and freelance and hobby jigsaw-puzzle cutters as well as large companies often thought his pictures well-suited for handmade wooden puzzles. Collectors consider handcut wooden puzzles to be works of art by skilled cutters, who individualize each puzzle. Sometimes, the cutter makes the pieces in whimsical shapes and letters; or they carefully cut around blocks of color to make it more challenging to piece together. 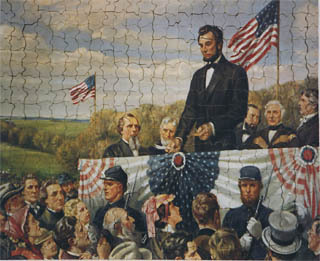 People who do puzzles gain an in-depth knowledge of and appreciation for the artwork of the puzzle. Wooden puzzles are cherished and passed down in families, and avidly collected. The 1930s in particular saw a boom in jigsaw puzzles, with millions of them made in a few short years. One could rent puzzles from department stores until the 1960s, when television finally claimed the leisure hours of most North Americans. 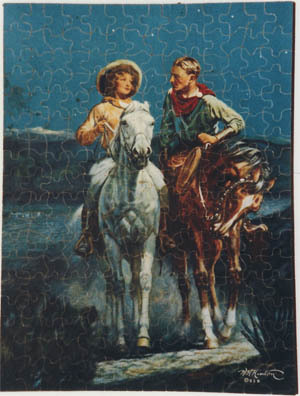 Many puzzle enthusiasts preferred hunting scenes and other outdoor subjects, perhaps because they took puzzles to cabins and on family vacations. 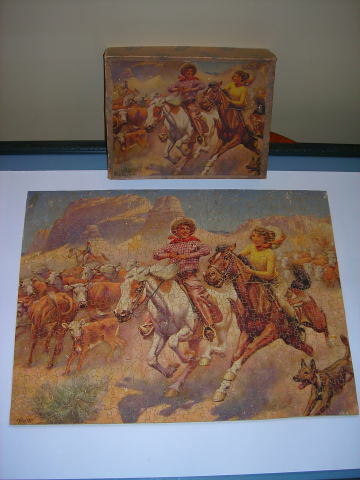 Companies who used Hinton's images on puzzles include Joseph K. Straus, Perfect Picture Puzzles, Tuco, Fairchild, Croxley, Guild, Dover, Buckingham-Knight, and Saalfield. Thanks to Anne D. Williams and to Chris McCann for answering our puzzle questions. A site featuring puzzles with Hinton pictures is published by Bob Armstrong. Above: wooden puzzle issued by manufacturer Joseph K. Straus in the late 1960s or so, using an image from perhaps the 1930s. There are three known scenes in this series, in which the cowboy cooks for the girl over a campfire, lets her use his cup to drink from a stream while he drinks from his hat, and this one where he escorts her on a round-up. In real ranch life women rarely participated out on the range, so the series is actually reflecting romantic ideals and shifting roles for women in general. The images below were supplied by Chris McCann. Starlight Trail, Perfect Picture Puzzles. Also titled Western Moonlight, Buckingham-Knight. Thrilling Adventure #2, Tuco and Saalfield.